With a new information technology system for Washington’s community colleges an estimated $45 million over budget, five years behind schedule and still not working properly, some legislators wonder if they should put a cap on how much more the colleges should be allowed to spend on the troubled project. 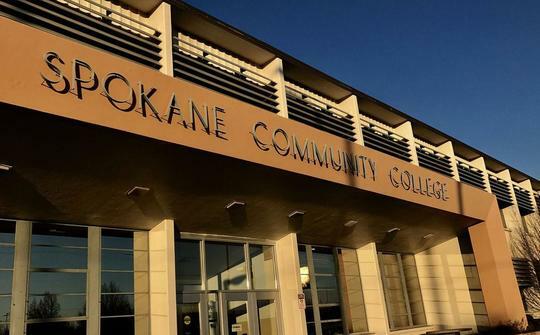 The new system was installed at Spokane and Tacoma community colleges as a pilot project in 2015 and immediately created problems for students, staff, administrators and accountants. The State Board of Community and Technical Colleges postponed plans to install it in the state’s remaining community colleges until all the problems were fixed. That process is not yet complete. The original price tag for ctcLink was $100 million, of which nearly $88 million has been spent so far. To get the system installed in all 34 community colleges, the new cost estimate is $145 million, with completion estimated for 2022. The bottom line for the troubled project is $45 million over budget and two years behind schedule. Last month the Association of Washington Business, the state’s largest and oldest business association, presented six companies with top awards at the group’s second-annual Evening of Excellence. The award recipients, selected from 18 finalists, were recognized for exemplifying the innovation, community spirit and environmental stewardship that make Washington a great place to live and work. Schweitzer Engineering Laboratories in Pullman, which designs and builds digital products that protect power systems around the world, took home the Employer of the Year award for its commitment to its employee-owners and the community. In March, SEL purchased the 28,000-square-foot former ITT Technical Institute building in the Spokane Valley to accommodate expansion. The company is expanding its Pullman facility, creating an additional 850 jobs and also is adding employees in the 4th Legislative District. SEL is a first-adopter of on-site, no-copay employee health clinics in 2012 to serve its employees and their families. The company is 100 percent employee-owned. Thanks to the generosity of Ed and Beatriz Schweitzer, the new Trinity Catholic School is being built without expense to the school, parish or diocese. 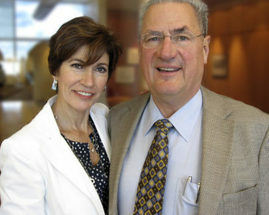 Ed and Beatriz Schweitzer (pictured above) are also instrumental donors to the Diocese of Spokane’s effort to build its first new Catholic school building in nearly 50 years – the new Trinity Catholic School. 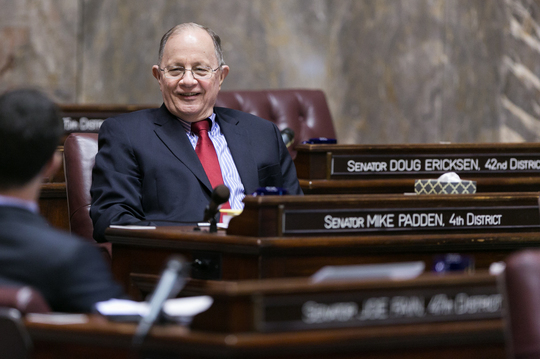 I look forward to recognizing the Schweitzers and SEL in the Legislature this upcoming session. This month we finally saw some public movement in the House of Representatives toward a solution to the Supreme Court’s ruling in the Hirst case, which has halted development in rural Washington and prevented property owners from putting a well on their land and developing it in any meaningful way. During the regular and special 2017 sessions, the Senate passed a bipartisan solution multiple times but House Democrats failed to hold any vote on any plan – including their own insufficient and harmful proposals. Many believe that Democrats have stalled on action because of political pressure from special-interest groups. On December 12 the House Agriculture and Natural Resources Committee held a work session on Hirst. It was a long meeting – in fact, the committee met for an extra hour to accommodate public comment on a proposal from the governor’s office. While an actual House bill is still a work in progress, the draft proposal discussed has several major flaws. First, the proposal would only allow families to withdraw up to 350 gallons a day, as opposed to the current daily cap of 5,000 gallons. 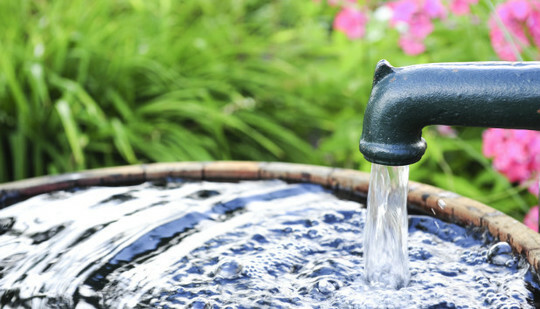 Secondly, the plan also would impose a $1,500 fee on new wells and set the stage for the metering of wells, something most rural Washingtonians strongly oppose. Finally, the plan also includes a $200 million kill switch – if the Legislature does not provide Ecology with $200 million over 10 years, the plan would be null and void! I’m glad Democrats finally seem to recognize that fixing the situation created by Hirst is a priority, but they still have a very long way to go to truly understand and help folks outside of the Seattle urban bubble. The 2018 legislative session will not have us working on a new budget from scratch, but instead making adjustments to the budget adopted in June. This is done through what is known as a “supplemental” budget. Each December the governor puts forward a proposed supplemental budget. It’s usually a wish-list fantasy that gives lawmakers an idea of the governor’s priorities, but often doesn’t actually meet budget or legislative realities. 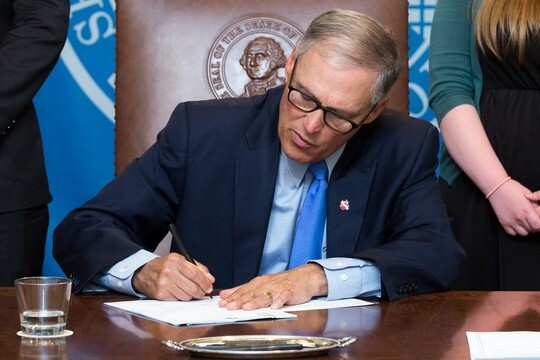 In what may be a sign of hope, Governor Inslee’s proposal for 2018 actually attempts to adhere to the four-year balanced budget requirement adopted by our Republican-led coalition back in 2012. That is new for him. He has always said that the law does not apply to his proposals. But not this time. That’s the good news. The bad news is that the rest of his proposal is the same old tax-and-spend liberalism that put Washington on budget rollercoasters for years prior to Republicans taking control of the Senate. For instance, his plan calls for an energy tax that would mean higher fuel prices, and he also wants to skip the required contribution to the rainy-day fund. That would require a 60 percent vote, and Republicans are not about to allow the governor to make such a fiscally irresponsible move. Without it, the governor’s budget would be $476 million short over a four-year period. The most recent revenue forecast indicates the state will bring in $1 billion more due to growth in the economy. There is no reason to hike energy taxes or raid the rainy-day fund – in fact, now is the time for tax relief. In 2015 it was Democrats, not just Republicans, who blocked Governor Inslee’s carbon (“cap-and-trade”) bill from moving forward in the House. To circumvent this legislative failure, he instructed the Department of Ecology to issue a rule aimed at accomplishing the same thing. The administrative rule, which unfairly targeted certain employers, was challenged in the courts. Fortunately, a judge in Thurston County with jurisdiction over the case recently declared that the rule was illegal and unenforceable. Ecology has repeatedly overstepped its authority, working around the Legislature to block rural economic development projects. It is encouraging to see the courts push back on this practice, although I don’t believe this will be the last overstep we will see. Again, we will be closing the district office after this Friday, December 29, to move back to Olympia for the start of the new session on January 8. Our phone number during the session will be 360-786-7606. If you have a question or concern about state government, please do not hesitate to contact our office. We are here to serve you!